You can easily replicate the look of a rosehead nail using a wood dowel, thereby adding another visual element to your project. 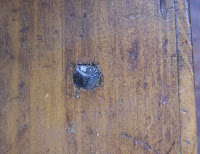 Rosehead nail photo is top left. 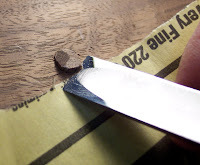 Tap your dowel into a predrilled hole of matching diameter and leave about 1/8" protruding. 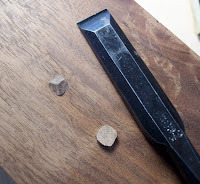 Put a piece of paper next to the dowel (the paper serves to protect your work surface) and hold your chisel bevel down while starting at the base and chiseling upwards. It's sort of a scraping technique. 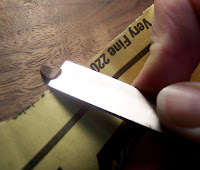 Work your way around and don't try to remove an entire side with one swipe so you can make subtle changes in the size of each facet. The rosehead nails I've seen all have 3 facets but maybe you've seen others. At any rate, it's an easy technique and instantly gives an aged look to your piece.